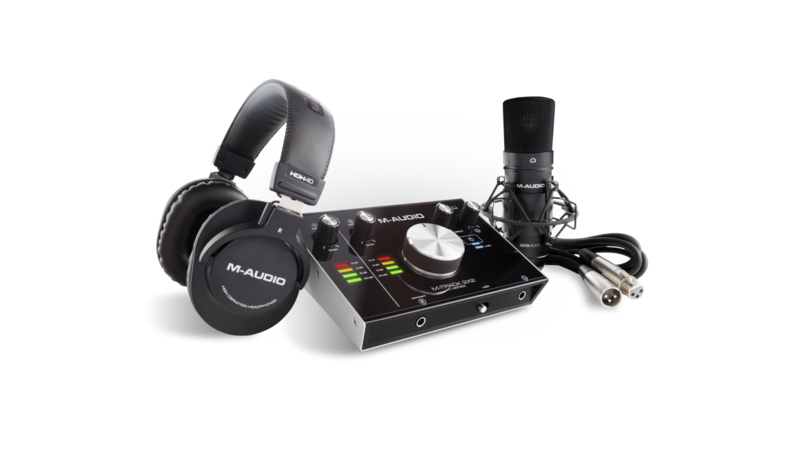 The M-Audio M-Track 2X2 Vocal Studio Pro has everything you need right out of the box to set up your own recording studio and unleash your creativity, including a 2-channel audio interface, condenser microphone, cables and even recording and production software. This guide will answer some of the popular questions about features and functionality of the M-Track 2X2 Vocal Studio Pro bundle. What is included in the box with the M-Track 2X2 Vocal Studio Pro? Where can I find the software to download? How do I authorize the included plugins? How do I install and authorize Cubase LE? Do I have to use Cubase LE? Why is my M-Track 2X2 not detected by my computer? Why is my microphone not producing sound? 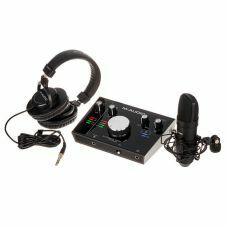 Can I connect something other than a microphone to the M-Track 2X2? What does the monitor knob do on the M-Track 2X2? What does the USB/Direct Knob do on the M-Track 2X2? How do I know where to set the gain for my microphone? I connected my guitar to input 1, but the signal is very low. Is this normal? All of the software can be found on your account page after registering your M-Track 2X2 Vocal Studio Pro, except for Cubase. Look for a Cubase download card in the box for instructions on downloading Cubase or see our video below. You'll find authorization codes for all of the included plugins located on your account page next to the respective download links. After installing the plugins, authorizer programs will appear on the desktop that can be used to enter your authorization codes and activate the software. With Cubase LE you can turn your Mac or PC into a beautiful and easy-to-use music studio. This compact DAW (Digital Audio Workstation) offers you all the basic tools for recording, editing and mixing everything from the initial musical idea to the final track. Cubase LE assists you all through the creative process — whether you are a songwriter, guitar player, vocalist or electronic music producer, Cubase has the right tools and features at hand. No. Your M-Track 2X2 will connect with virtually any DAW or audio recording software for multi-channel recording. Or just use it as an audio output for your computer to listen to iTunes, Spotify, and other media players. The M-Track 2X2 comes with a USB-C to USB-C cable as well as a USB-C to USB-A cable to ensure that it can connect to all current and future USB ports. USB-C is becoming the new industry standard connector and cable for connectivity and power. For more information on USB-C connections, check out this great article. There are no differences in audio quality between the USB-A, B, or C connections. No. The M-Track 2X2 is USB bus-powered meaning that it is powered simply by connecting it to your computer with the included USB cable. No additional power connections are necessary. The M-Track 2X2 requires a driver to connect with a Windows operating system. If you're using Windows and have not already installed the driver, navigate to our Drivers & Updates page to download the latest Windows driver. Choose USB Audio and MIDI interfaces > M-Track 2X2 > your operating system, and then click Show Results to get a download link. The M-Track 2X2 is class compliant for Mac operating systems and does not require a driver. If you still have trouble, follow our article here for some troubleshooting tips and tricks. The Nova Black microphone is a condenser mic which means it requires phantom power to function. Your M-Track 2X2 is equipped with a +48V phantom power switch on the front to provide the necessary requirement. Connect the microphone before enabling phantom power. Phantom power is a DC (direct current) voltage that is used to power active electronics such as a condenser microphone. Yes! The M-Track features a combo Mic/Line input for Input 1 that will accept XLR, TRS and TS cables. For microphones, use an XLR or 1/4" (6.35 mm) TRS cable. For a guitar or bass with an active pickup, use a standard 1/4” (6.35 mm) TS cable. For line level signals, use a 1/4" (6.35 mm) TRS cable. View the input signal level with the LED Meters. A guitar or bass with a passive pickup should be connected to Input 2 on the front using a standard 1/4" (6.35 mm) TS cable. The monitor knob on the M-Track controls the level of the Main Outputs, which are ordinarily connected to your powered monitors or amplifier system. To control the level of the headphone output, use the headphone volume knob in the top right. What does the USB/Direct knob do? The knob labeled USB/Direct adjusts the mix of the audio signal from your inputs (Direct) and the audio output of your computer (USB) that will be sent to the main outputs and headphone output. This prevents latency by allowing you to listen to your microphone or other input signals directly from the M-Track. Latency is the delay between the actual sound of your instrument/voice and the recorded signal returning from your computer/DAW. If you are experiencing latency when recording, adjust the knob towards the Direct position to increase the blend of the direct signal from your inputs in your monitor mix. This will let you hear the incoming audio from your inputs without latency while still being able to hear the playback signal from your DAW. Be sure to turn off track monitoring in your DAW to prevent a duplicate and delayed monitor signal. For most situations, setting the knob near the center works well. The level of the gain will depend on the signal that you're recording. In general, a strong signal will be somewhere between -20dB and -6dB (i.e. the bottom two lights on the M-Track channel LED). This gives you plenty of headroom for peaks without being too low. In other words, turning the gain up to a point where your loudest level (within reason) reaches the -6dB light is a good setting. It's also ok to hit the -3dB light, but going any higher could result in audible distortion. Depending on the strength of your recording source (voice, instrument, etc. ), it's not uncommon to turn the gain knob about 75% of the way up. Use Input 2 for guitar. The 1/4" combo jack for input 1 is intended for line-level signals like keyboards and synthesizers. To connect a guitar, bass, or other instrument-level devices, use the 1/4" (6.35 mm) input for channel 2 located on the front of the M-track to properly amplify the signal. Remember to then choose Channel 2 as the input for your track in your DAW to record the instrument signal. The M-Track 2X2 supports up to 24-bit and 192kHz studio-quality sample rates to capture every nuance and subtlety of your performance.